HF: Delfino Noronha (1824-1900) ran a printing press in Hong Kong from 1844, Noronha and Co., a quasi-government printer, which later on became the actual Hong Kong Government Printer. He was also involved in the first regular ferry between Hong Kong Island and Kowloon though this was apparently little more than a weekend pleasure launch to his “country house” in Yau Ma Tei. HF: The originally posted article stated that this image was of Delfino Noronha Courtesy: JM Braga Collection, National Library of Australia. However, Matthew Carvalho left a comment below the article suggesting: The photo you identify as Delfino Noronha in this article is incorrect. The photo is of Januario Antonio de Carvalho, chief cashier in Hong Kong, and close friend of Delfino Noronha. 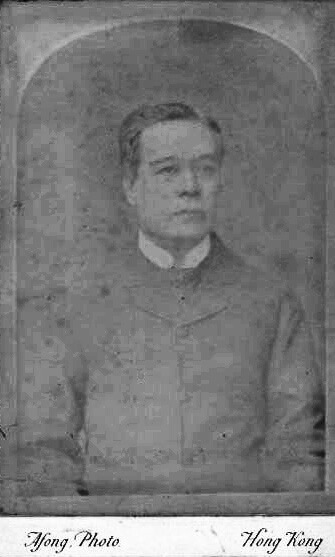 The first “Portuguese” to establish a commercial enterprise independent of the British (although they remained clients), Noronha was in a position to hire skilled compositors from his old school, St. Joseph’s in Macau. As the largest employer of Macanese workers in Hong Kong, Noronha and his staff produced finely detailed editions in multiple languages. These attracted the attention of an international audience, including Church leaders, ambassadors, governors, and wealthy merchants, as well as visits from world leaders, including Jose Rizal, a Filipino nationalist. Noronha was held in such high esteem that one Hong Kong governor envisioned Noronha & Co. would remain the colony’s printer “in perpetuum”. This article was first posted on 17th September 2015. Far East Currents: Homepage The Portuguese and Macanese Project website is interested in “Macanese” which it broadly defines as either: 1) Portuguese Eurasians born in Macau; or 2) the descendants of Portuguese Eurasians born in, or with cultural roots in, Portugal, Goa and western India, Macau, Hong Kong, Canton, Shanghai, Japan, Malaysia, Indonesia or Timor. The photo you identify as Delfino Noronha in this article is incorrect. The photo is of Januario Antonio de Carvalho, chief cashier in Hong Kong, and close friend of Delfino Noronha.